In San Francisco, where hungry lunchtime tech crowds meet Israeli transplants, refugees, and third-generation synagogue-goers, Jewish food is a hodgepodge of old and new, a fertile ground for creativity. Israeli street food is served at fast-casual establishments, Arabic and Roman staples are reimagined at high-end restaurants, and influences from Montreal and Palestine are not unheard of. In between, fantastic bakeries are producing bagels and pastries that loosely abide tradition. San Francisco’s newest and hottest Italian restaurant has a significant Jewish plot twist; it serves a number of dishes inspired by the historic Roman Jewish ghetto. The inventive takes on centuries-old recipes can be found in a menu section named Cucina Ebraica – standouts include crispy artichokes with sumac and warm beef tongue with crispy capers. A kosher bakery operated by Israeli owners where Jewish carbs from all over the world come together. There are fluffy pitas, fragrant challahs, Iraqi sambusak pastries stuffed with cheese or tuna, babkas, and Lebanese lachmajoun, a tasty riff on a pizza. It’s impossible to choose just one. 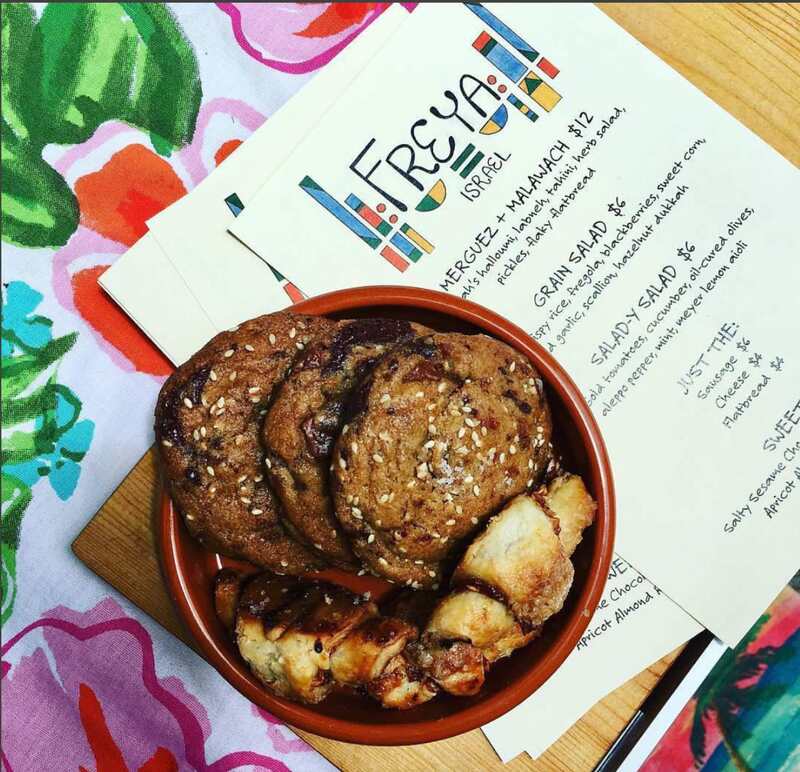 Freya is a semi-secret, clever little pop-up by two Jewish friends, appearing monthly in various bars in San Francisco and Oakland. The menu is influenced by Israeli and Middle-Eastern flavors and may include brick chicken shawarma one day, and malawach, an addictive Yemenite breakfast pastry, the next. Feeding loyal customers for fifteen years and counting, Miller’s is a decadent parlor of Ashkenazi comfort food. Kasha varnishkas? It’s here, swimming in brisket gravy. Stuffed cabbage rolls? Artfully arranged. Knishes? Seven versions of them await. And, of course, there are smoked fish platters and meat sandwiches. Ask any Israeli-American what they miss about home, and chances are “hummus” will be a popular answer. Oren’s Hummus, a chain with a number of locations in the Bay, is providing a worthy local version. 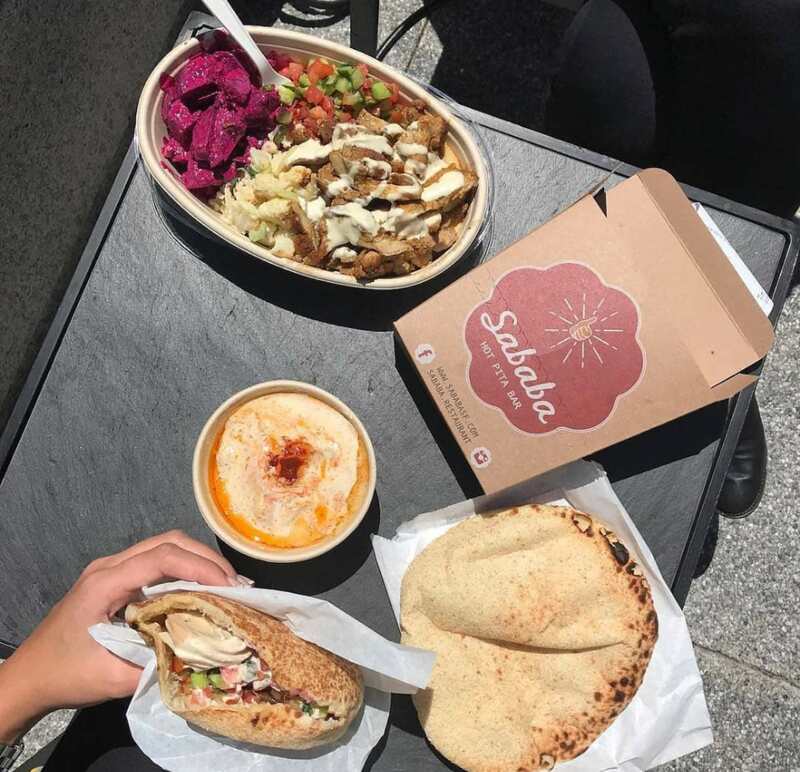 In its newest San Francisco outpost, you’ll find authentic salads, hummus bowls with different toppings, homemade fluffy pitas, and chicken schnitzel, a crowd favorite. A self-described “pita bar,” where Israeli street food is celebrated daily by hungry office workers. The pitas are puffy and trustworthy and can be stuffed with a selection of fresh salads, falafel, or lamb kofta. The sabik, however – a vegetarian Iraqi pita sandwich with eggplant, hard boiled eggs, and spicy pickled mango sauce – steals the show. 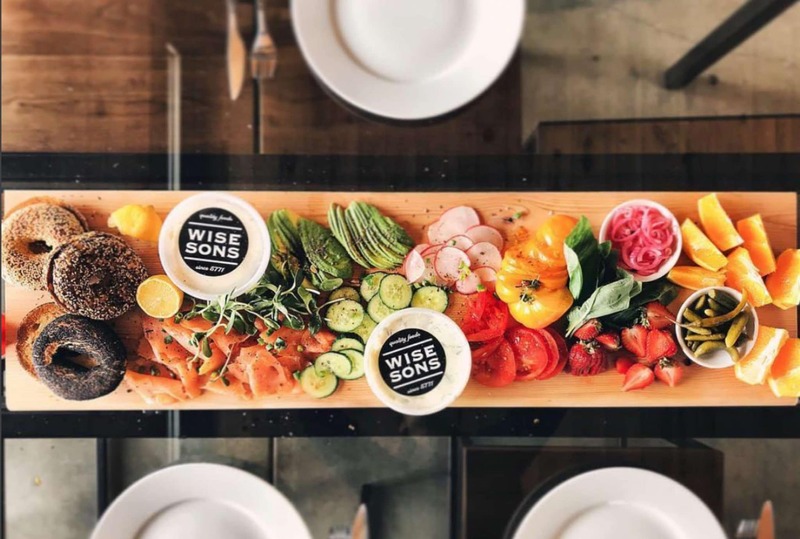 This local chain of East Coast-style delis is all over the Bay Area, but consuming chopped liver and kettle boiled bagels with shmear is especially fun at Wise Sons’ Contemporary Jewish Museum location, where interesting exhibitions enhance appetites. The menu is classic, from the reuben to the rugelach. 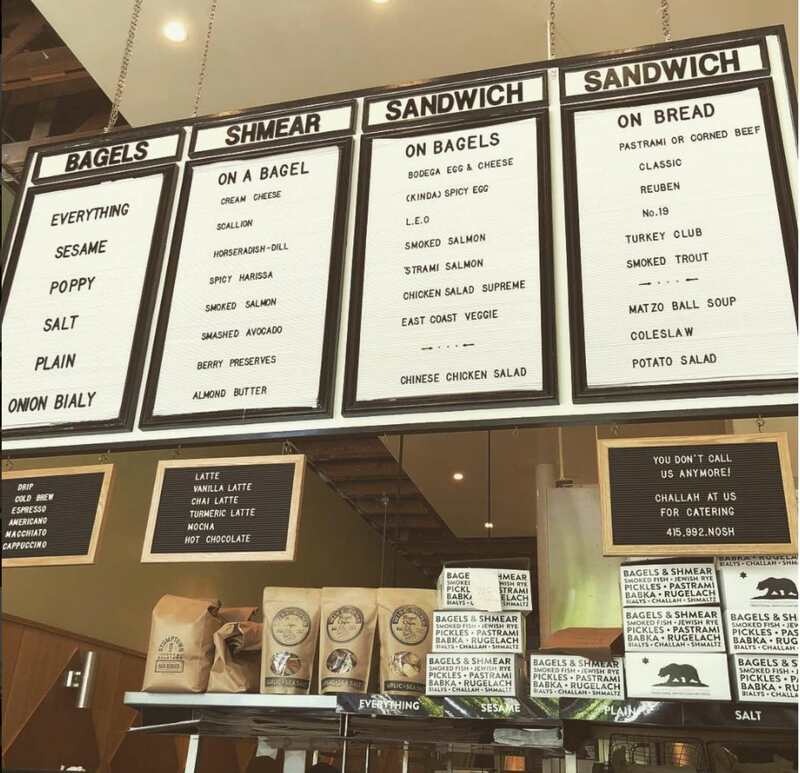 Berkeley’s newest deli is Jewish, with a Montreal twist. What does that mean? Hearty sandwiches with smoked meat, a pastrami-corned beef mash-up, juicy and uniquely spiced brisket, latkes made with rye bread, and, for good measure, a few versions of poutine, a dish decadent enough to fit into the Jewish canon. The name translates to “at home” in Hebrew, and the food delivers that cozy, homemade promise. In the menu, you’ll find vibrant salads with Middle Eastern flavors, skewers, falafel, and hummus plates. Whatever you do, don’t miss the Majaera, a satisfying dish of lentils, rice, fried onions, and yogurt sauce. A prime destination for all things bagel, Beauty’s offers loaded bagel sandwiches, stuffed with anything from smoked trout to hummus. For breakfast, there’s lox omelet, a colorful shakshuka, and other comforting Jew-ish dishes. Delicious wood-fired bagels with a variety of toppings can be purchased to go, alongside signature spreads. 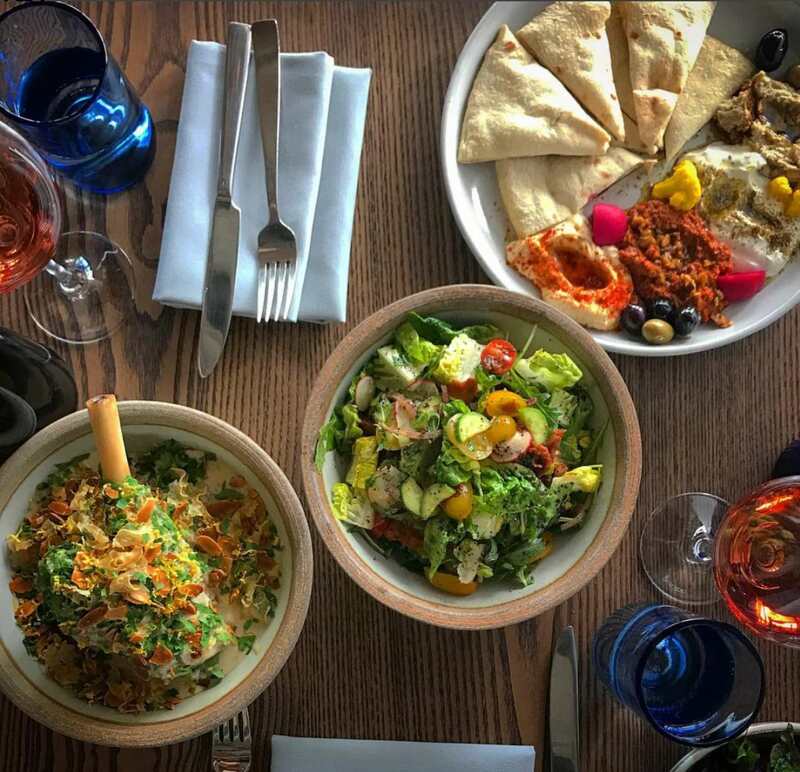 The newest endeavour by Oakland’s rising star Reem Assil, Dyafa is an Arabic restaurant mixing tradition with very Tel-Avivian, elevated Middle Eastern touches. In the colorful menu, you’ll find shakshuka alongside spicy chicken kebab wraps, labaneh with fava beans, and a glorious maklouba, a rice pot common in Israeli-Arab and Palestinian feasts. A beloved Berkeley institution, Saul’s is everyone’s go-to for matzo ball soup, pastrami sandwiches, and dreamy cheese blintzes. The booths are perpetually full with regulars, so you might need to wait for a seat, but grabbing some lox, pickles, and a cookie from the deli case ensures a Jewish party on the go. By Flora Tsapovsky, a food and style writer splitting her time between San Francisco and Tel Aviv. Flora is the founder of Bicoastalista, a website dedicated to bi-coastal living. She contributes to the San Francisco Chronicle, Afar, Tablet, and Bon Appetit.